Hertug was selected as elite stallion in Denmark 2004 because of his offspring. After winning the Danish championships for three years in a row as 4-, 5-, and 6 years old he now is showing with great success in St. George and Intermediere I. He was the winner of the material test in dressage. Hertugs sire, elite stallion Schwadroneur, has put his stamp on Danish breeding. His dam’s sire, elite stallion Donauwind, was also a big producer of riding horses, medal mares and approved stallions. Among those Abdullah (Olympic gold, Los Angeles, 1884). 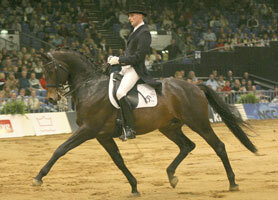 Hertug comes from the best Trakehner lines of mares in Denmark. His dam, elite mare Hellas received as a 3 year old a silver medal, and 23 points plus a silver medal for breeding. She is also the sister of the approved stallion Henkel and the dam of three top studbook mares. Hertug‘s first offspring now show their talent under saddle, and it is like Hertug as young. Super movements and easy to ride. Hertug is approved in Denmark, Schweden, Oldenburg and the Trakehner assosiation in Germany.